Even more horrifying is what this represents – more than 800,000 veterans who are waiting for their claims to be processed, which can take over a year. The workload for disability reviewers varies from state to state, creating further inequity. Nebraska, South Dakota, and Maine have shrinking backlogs but the nationwide average wait time is 286 days for claim review. I realize that the VA is not CMS is not Meaningful Use is not the Affordable Care Act. However, they all come from the same place. In the spirit of reform and pay for performance, I’d like to offer a new program for Congress to write into law. Any Meaningful Use, PQRS, or ePrescribing penalties should be placed on hold until the federal government shows it can get its own house in order. 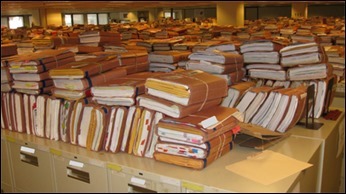 Since MU is grading me using a variety of metrics as a proxy for quality care, we can use the VA claims backlog as a proxy for process efficiency. The VA is the quintessential government-run bureaucracy. It has a lot of advantages over the way that the rest of us practice – single payer, single set of regulations, and a well-defined patient population. By extension, the VA disability claims should be able to benefit from some of that homogeneity and be a pinnacle of efficiency. Of course this will never happen since the whole bureaucracy is brought to us by the same entity responsible for the sequester debacle. I read with great interested about Vanderbilt University Medical Center and what they’re doing to balance their budget shortfall: halting employee accrual of vacation days, cutting discretionary spending, eliminating bonuses, and freezing salaries. VUMC plans to cut $20 million out of this fiscal year’s budget and $30 million next year. To show solidarity with its constituents, I’d like to see members of Congress freeze their own salaries and benefits until they deliver a balanced budget and show that they have a plan for the future. While they’re holding off on penalizing us, they can also back off on MU (and other) audits to allow health care providers to actually focus on caring for patients. When their house is in order, then they can consider telling us how to run ours. Thank you, Dr. Jayne, for bringing to light this issue on backlogged disability claims. I must say, I had no idea, and am ashamed that no one in Washington seems to think anymore than that of our veterans and the men and women who we count on to protect us. As Commander in Chief, it would seem to me that our Prez should adopt an approach of “the buck stops here”. Until then, shame on all of us. It’s time to rattle some cages! Vets deserve waaaay better than that. PS – why isn’t the good Doctor Fazard on his soap box about this mess? Oh, I forgot, it’s not his department. I always see people suggest that congress take a pay cut, but we are forgetting that the whole reason we pay them a livable salary is to increase the ability of common people to serve in government. If we don’t like what’s happening in congress, we have mostly ourselves to blame (well, us and the Supreme Court). We could instead elect normal people that understand normal people’s lives. You are right on Dr J. However, the only solution is for WE the people to start getting involved and informed to say enough is enough and start electing officials who are not scared of their jobs and who truely do put the people first. Thanks for your openess to bring the real issues to the forefront. Keep it up. Maybe someday the TAKERS in Washington will all go away and the people can return to power to run our country. Amen, Dr. Jayne!!! How Washington can allow our veterans to suffer through this red tape mess is unconscionable! I don’t think you are telling the whole story here. The quality of healthcare delivered by the VA by objective measures is unparalleled. The VA has a fully integrated electronic health record across more than 1400 sites of care. They have an aggressive performance management program that allows for cost-efficient, high-quality care with a focus on optimizing access. Reference the book “The Best Care Anywhere” by Phil Longman. On the other hand, disability benefits are administered by the Veterans Benefits Administration, a different entity than that which delivers healthcare. And yes, it seems they are struggling with disability claims backlog — probably related to process issues as well as recent VOLUME of claims. This is more about running a disability program, more analogous to Social Security Disability than healthcare delivery. I fail to see the connection to MU that is made here and in the comment thread. Finally, my understanding is that the VA is making considerable effort to better manage this process including moving away from paper.